These four societal archetypes are inevitably intertwined, and their aims entirely reconcilable. Although their behaviors are dissimilar, their differences fit together into one dysfunctional whole, comprising a society’s collective relationship to information, and indeed, its own truth. To expand on the definition offered above, idiots avoid all new pertinent information in order to maintain their perspective, never questioning the status quo. Zealots ask certain questions of certain information, ignoring unaligned information in order to maintain their perspective, supporting the status quo at all costs. Elitists question information in order to manipulate and reap gains off those who don’t know, benefiting from the status quo. Patriots question information to educate themselves and share it with others, in order that we might progress beyond the status quo. Despite dramatic alterations in the world’s geopolitical landscape, and some fluctuation of individuals from one group/role to another over time, the dynamic between these groups has historically remained the same. What has changed in the technological age is simply that we have more ways and means to use, misuse, refute and refuse information. Today, just as ever, idiots avoid all new pertinent information in an attempt to maintain a limited, comfortable perspective. Zealots believe they have “the answer”. They ask certain questions of certain information, but ignore and dissociate from information that is unaligned to their pre-determined perspective. Elitists question information in order to manipulate those who do not have that information, to their own benefit. Patriots – true patriots – question information to educate themselves and share it with others in order that all may progress. These archetypes may seem like generalizations; and they are. They are also ancient and universal in structured societies. How people interact with new information is a result of both primal response and experiential programming, so understanding these archetypes can reveal a great deal about people and their character. In my experience as a truth-seeker and an activist – a patriot – this is the only thought-model or assumption that can truly help us understand how people relate to information, and therefore how we can best relate information to them. There is an ancient adage and image that depicts the thinking and being of people through a series of archetypal monkeys; Hear no evil, see no evil, and speak no evil. Commonly known as The Wise Monkeys or The Three Wise Monkeys they are typically depicted sitting next to each other in a row. One covers its eyes, blinding itself. The second covers its ears, deafening itself. The third covers its mouth, gagging itself. Of these supposedly wise monkeys, none seem much the wiser for its ignorance. In fact, each character is hampering itself and its experience of its surroundings – of truth and information – in one way or another. And yet this adage of ‘wisdom’ is still widely accepted. What most people don’t realize, however, is that the depiction of these ‘Three Wise Monkeys’ is a deliberately incomplete narrative; there is actually a fourth Wise Monkey that is seldom depicted in western interpretation. Representing the virtue ‘fear no evil’, the fourth monkey sits with its arms folded over its abdomen. It is the patriot who, fearing no evil, questions information to learn and share it with others, in order that all may progress. It is indeed the only of the monkeys that shows any wisdom at all! The Four Wise Monkeys: hear no evil, see no evil, speak no evil, fear no evil. The four wise monkeys are reflective of the four archetypal reactions to information. In an oligarchical society, such as ours, which is structured to benefit a few at the expense of many, idiots shut their eyes to all information that puts this reality in their face and simply refuse to learn. Zealots fervently support the official narrative; they close their ears and do not hear what’s really going on, but tend to keep speaking nonetheless. Elitists keep their mouths shut and do not disclose what is seen and heard, understanding what is happening but opting rather for silence. Patriots, the least common of the monkeys, use all their senses; they observe but do not react in fear. The archetype of the four wise monkeys is considered to be one of the oldest axioms with a corresponding image. The original concept has its roots in Chinese philosophy and can be traced back to at least the 8th century. In Japan, it is interpreted as akin to the Golden Rule and is also a play on words. The Japanese word for monkey is saru and the expression in Japanese uses verb forms that sound like the word monkey; mizaru, kikazaru, iwazaru and shizaru. Outside Japan, the predominant presentation of the wise monkeys around the world lacks the fourth monkey, fear no evil, shizaru. Buddhists and many others interpret the wise monkeys as a karmic reminder of sorts not to participate in any form of evil, but it is more than that. This traditional interpretation states that one should not see, hear or speak of inconsequence. It is true that avoiding irrelevance is wise, but this is only part of the truth. In Asia people conceptualized that all movement, physically and metaphysically, begins and is anchored in the abdominal region or dantien, an energy point just above the belly button. The fourth monkey is unafraid and unflinching, and watches and listens calmly, with hands resting on the dantien. Like his companions in varied measure, the fourth monkey looks, listens and communicates, but does not react in fear of what is seen, heard and said. It is no wonder the fourth monkey has been all but deleted from the archetypal presentation of the wise monkeys adage. He is the only truly wise monkey of the four, the patriot. The fourth wise monkey faces the truth without fear, a distinct contrast to the other three, apparently frightened monkeys. It is an old example of a missing whole truth and a partial presentation. The absence is normally unconsidered or trivial, but helps to point out the very lesson of the wise monkeys maxim. Similarly, in George Orwell’s seminal fiction/warning 1984, the Brotherhood (who are working to bring down the fascist rulers, ‘The Party’) are similarly deleted through the admission of language. 1984 by George Orwell tells the story of an imagined dystopian future. The Telescreen, which constantly transmits as well as oversees its audience. The “Theory and Practice to Oligarchical Collectivism” is the book within the book, providing the guidelines for this distopian society, which posits that there are three types of people in the society: the high (the Inner Party), the middle (the Outer Party) and the low (the Proles). Each conforms to the will of the collectivist society. Those of low status are forced to accept the false imagery and demands of their society as their reality, they have been prisoners their whole lives and do not notice the fact they are imprisoned. In the middle (the Outer party) are the unchained, remaining totally transfixed on the party line, as told by the Telescreen. They are so loyal to the imagery and narrative created by their captors that they will believe whatever they are shown, rather than observe for themselves. They will believe two plus two is five, as the saying goes, as long as it is presented as such on the Telescreen. Essentially, they are the frightened monkeys. In the totalitarian society portrayed by Orwell in 1984, the agenda physical and psychological monopolization of the society is arguably more advanced (but decreasingly so) than what we see in modern politics. However, just as in 1984 and the ancient adage of the wise monkeys, the fourth characterization – that of the true patriot – is mostly absent from our mainstream narrative. In reality, the fourth monkey, the patriot, those who fear no evil and act accordingly, are deleted from public consciousness in exactly the same way. By observing and questioning actuality, without fear, the patriot poses a distinct threat to the status quo. Institutions can easily influence the three monkeys to their advantage, through the manipulation of information, but they cannot usethe fourth monkey in the same way. Institutions delete and distort any notion of such, as they view it as opposition to their agenda of information suppression — and because they themselves are afraid. That is why they operate in the shadows, hide their true actions and attempt to delete the truth. The fact is, the mentality of the fourth monkey – fear no evil – frightens the crap out of institutions! And fear is not just propagated by those institutions but is also a driving motivator used within their own ranks; patriotism is of course, not welcome there either. Within and without their own ranks, institutions seek to isolate and disempower true patriotism by distorting and confusing its meaning, and eliminating the notion altogether by instilling nationalistic ‘you’re either for us or against us’ thinking – which is simply elitism dressed up in patriots clothing. Today, government and media institutions have attempted to delete the notion of true patriots and transform our understanding of ‘patriotism’ into flag-waving idiocy, war-minded zealotry, and hyper-collectivist elitism. In an information war, they work both sides… the guilty can be made to look like victims and the victims to look guilty, sabotaging the clear passage of truth… By allowing ourselves to be manipulated, we make it easy for them to subjugate, infiltrate, divide and conquer. One of the main ways that opposition is controlled and absorbed into the background by those in power, is to create another system that appropriates it. An example offered by George Orwell in 1984 was the adoption by the Inner Party of ‘Big Brother’ as the human image to represent them via the Telescreen. Big Brother does not reflect the patriotic spirit of brotherhood, or of The Brotherhood, rather it provides an ‘official’ narrative while appropriating and misrepresenting the notion of brotherhood into a ‘brand name’ of the Telescreen — one that instils a psychology of collectivism, not brotherhood, which is a big difference indeed. Today, institutions transfer and confuse words and ideas in the same manner, mixing up themselves, their policies and their products, with patriotic ideas and words. The‘Patriot Act’ is the perfect example of the modern era. Quite simply, they take the meaning of words and archetypes, and flip them. Deleting patriots, and the notion of ‘fear no evil’, from the socio-political narrative is a tried and tested way of the controlling elite to subjugate the society it rules. Idiots and zealots don’t question it, and elitists help to propagate it. In today’s political arena, debate is dominated by polarized, dualistic thinking — the opposition of two competing ideas, two parties, left and right. Is it so? Is it not so? What if the truth was somewhere in the middle? Or somewhere entirely? In reality, to consider any information or situation comprehensively and in its entirety, questions must be posed infour ways, not just two. Is it so? Is it not so? Is it both? Is it neither? Is it good? Is it bad? Is it both? Is it neither? The very inquiry into the origins of human thinking and being is typically posed through a limited, polarized mindset. Are we the way we are because of nature? Or nurture? This kind of thinking, of course, is a threat to institutional monopolization, hence institutions prefer to encourage thought forms to two, or three (if one considers accepts both sides of a duality, without considering the unlimited potential of the ‘neither’ option). And, if elitist institutional forces cannot eliminate the patriotic fourth monkey by the manipulation of the society’s psyche, they distort and confuse what it means to be a patriot, and who the real patriots are. They co-opt traits and present their own qualifications of patriotic behavior, which are far more consistent with the role of idiot, zealot or elitist than patriot. Four is symbolic for completion. The pronunciation of the word “four” in Japanese and Mandarin is similar to the word for death. In Japan and most of China, death and four are near homonyms and the relation instigates fear and aversion of the number. Four is a number that evokes fear in parts of Asia and is superstitiously avoided as one would avoid word of death. Observe reality and openly communicate with others about the nature of the conditions around you. By observing and speaking without fear, you will find what is hidden, by way of what is already known. When we stop and consider what is “already there” in our modern world, it becomes obvious how regularly institutions maintain lies by partial presentation of fact and proceed, as if the absent piece never existed and therefore does not matter. For example, did Iraq actually have weapons of mass destruction? No, but the partial presentation of fact on the part of the U.S. government and their media (the Telescreen) meant that war was carried out in the name of protection, despite the omitted absence of any genuine threat. The occupation of Iraq continues long after those facts were revealed. When power is at stake, institutions always insist that there are three when there are four. They insist that they have the correct formula, and that there is no reason to question it — only a need to believe it. Just because one is ignorant of an uncomfortable reality does not mean that one is protected from it. There are some things that need no inquiry, and ignorance is most definitely not bliss. Ignorance is temporarily bliss, until the moment arrives when knowledge is needed, at which time one inevitably pays for their ignorance. Ignorance is strength to institutions. Institutions instil ignorance because ignorance results in fear and fear results in dependence, and dependence creates profitable, compliant societies. And if all else fails, they send in the military. Startlingly, this is exactly what is unfolding more and more each day in the United States, as the institutionalization and militarization of our society continues at the instigation of the elite’s consumeristic and nationalistic fear-mongering. The U.S. Government has spent decades concealing the truth, and now that it is losing what Hillary Clinton described as “the information war”, it is tightening its controls on its own citizens by privatizing critical food supplies, signing trade agreements that bind the U.S. to rules that supersede U.S. federal and state laws, increasing monitoring and surveillance of its citizens, and engaging military operations on its own soil for the first time in history. And in each case, the vital voice of the patriot has been excluded from the public narrative, or deliberately confused on the Telescreen with the voices of idiot, zealots and elitists. In my view, Mahatma Gandhi was a true patriot. While he was not without fault, he functioned as a fourth monkey in every facet of his public life. Unlike the idiot, zealot and elitist, Gandhi lived a lifestyle of few attachments, and in his public life embodied the characteristics of the fourth monkey; fear no evil. Excluding the clothes on his back, his spectacles, sandals and comb, Gandhi’s one material possession was a porcelain statue of Three Wise Monkeys, which he received as a gift from Chinese admirers. Today there are statues of the Three Wise Monkeys at Gandhi’s one-time residence, where he began his march to protest the taxation and monopolization of sea salt in 1930. The lesson of the wise monkeys is layered in its interpretation, but what cannot be debated is that the truly wise maintain all of their senses. The wise do not participate in evil nor ignore evil in one way or another; they do not observe evil in fear of it, but in calm, determined awareness. Like the fourth wise monkey, they stay informed and alert. They ignore only irrelevance. They listen and observe without prejudice, not hindering their own senses for fear. They are characterized by discerning vision, an understanding ear, thoughtful speech and the courage to hold their ground. People are not monkeys. People are people; it is our reaction to information that defines us. We are all alike; we all want food, and clean water, and personal freedom for instance. The difference between people is in how they react to information. Our reactions are often based on prior information, experience and acquired tolerations or fears, and people can transpose from one to the other depending on the conditions and circumstances. Thinking as a patriot does not necessarily mean you want change for its own sake, only when change is necessary to make a right or cancel a wrong. They are able to embrace change, including stopping, by openly questioning new information. Patriots are willing to implement change through their action and inaction. Patriots use their senses and cease participation in the perpetuation of manipulated information. Patriots are a rarity in society, like four leaf clovers in the forest, but they indeed exist. Patriots are not afraid to stop, look, listen and speak up. Patriots do not fear repercussions of their speech, they are unafraid to speak the truth. Most everyone is afraid of something; afraid of what evil they might see or hear, or have to speak out about. Patriots may be afraid at times as well; everyone is afraid sometimes. But only true patriots are not afraid of obtaining or sharing information, and speaking out on their perspective of truth. Patriots are unafraid of taking right action, or halting action on behalf of what is right. If patriots are wary of anything, it is the outcome of the fear and ignorance that continues without the freedom and availability of information. Patriots look, listen, speak up so that other individuals may benefit. The strength of the Patriot lies in the lessons of history. Exploitative institutional mechanics can be dismantled and bettered, and individuals can ascend institutional walls. Just as people are capable of creating institutions, people are capable of halting or developing exploitive institutions as well. Institutions after all, are only a human structure — a social machinery. When pushed too far, idiots and zealots are capable of realizing they have blinded their eyes and plugged their ears to the truth. And when they push a population too far, controlling empires will inevitably fall. When evil is about, the only way to cancel it is to look, listen, speak up about it and cease support of it without fear. Stand up forthrightly, unafraid. Do not cooperate with evil, but face it head on. When evil becomes institutionalized, by governments and corporations, it must be confronted by the people with foreknowledge of their surroundings and conditions. Only by using the senses and refusing to serve evil, can one make monkey-work out of canceling the evil that lurks behind the shadows of our society. 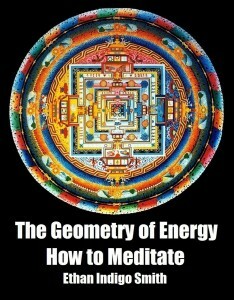 Author Ethan Indigo Smith’s latest book The Geometry of Energy explores meditation and meditative energies through the sacred four dimensions of geometry. Simple and profound, it is an empowering four-step meditation designed to lead to individuation, self-development, an enhanced understanding of energy, and psychological and spiritual cleansing. 108 Steps to Be in The Zone a set of 108 meditative practices for self discovery and individual betterment, including techniques to develop balance, transmute sexual energy. For more information, visit Ethan on Facebook and Amazon.